This is a site devoted to casting a spotlight on those comics in the Sunday pages that for one reason or another, were never collected. Also, I'll be paying attention to other comics worthy of wider recognition. In my last post, I mentioned how artists tend to borrow from each other all the time in terms of inspiration. As Pablo Piccaso said, "Bad artists copy, Great artists steal." In particular, I was thinking of this mini essay from Dirk Deppey - four years ago. The painting, Parmigianino’s Madonna with a Long Neck (oil on wood, 1535; larger version available at this link) is an excellent example of where this approach can lead: The figures are technically polished but unnatural as hell, with supple shadows and drapery folds unable to fully distract the fact that the bodies they depict are warped and deformed. The Madonna’s fingers and neck are unnaturally long, the infant in her lap has the body of a nine-year-old but dwarfish arms and a newborn’s face, the figure behind her holding a scroll has an arm longer than his leg — and goodness knows where the stomach of the waterbearer to her right is supposed to go. 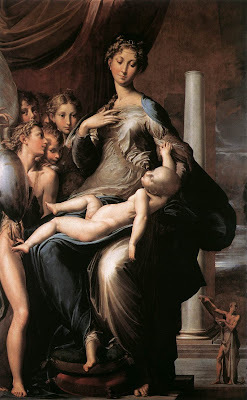 Parmigianino has the surface tics of the Rennaissance masters down pat, but his work displays none of the anatomical understanding by which they came to be able to create such accomplished illusions of form and light. Mannerism is an artistic game of Whisper, with details lost and distorted as they move further away from their point of origin. I have a very selective memory - I can recall things I've read ages ago, and be very upset when my search results turn up nothing because I can't recall the exact wording that would help limit my research. Conversely, I cannot retain anything I hear for more than five seconds unless it's written down. If I don't meet somebody over the span of two weeks, I'll forget about them. I'm usually surprised when somebody comes up and says they remember me when I clearly don't remember them. When asked if I know who they are, I usually respond with, "Let's pretend I do. ", so I won't come off as rude, and we can get to the point of the conversation. I'm reminded of a short story in the guidebook, Laughing and Living with Autism, which is a collection of humourous stories involving Autistic kids. Despite all the pain, there are times where Autistics do things that make parents gape in awe for doing things that no normal human being would ever think of doing. The example I'm thinking of was where there was a teenager who would always greet everybody he met with an enthusiastic "Hi! ", even if he never saw them before. Complete strangers would try to recall who this friendly young man was without much luck. In the occasions where he would get a welcome reply of "Hello! How are you doing? ", he would respond with a confused, "Do I know you?" The stranger's facial expressions must've been very interesting to see as they tried to figure out this Memento train of thought. This is me in a nutshell. I always assume people know more about me, since they know me better than I know them. It fits with my paronia of everybody having open access to my profile, while I don't have anybody else's folders. I simply don't have the patience to figure out somebody's likes or dislikes by talking to them. I'm much more comfortable seeing their tastes online, so I can determine whether they're worth talking to or not. Autistics/Aspergers use the term Neurotypicals when referring to people who have no trouble talking to people around them, but I find that term demeaning. I prefer to use Doug Camill's description. As he mentioned in a column about narcissism: "Why am I not surprised to learn that Celebrities are more in love with themselves than us Dull Normals?" To everyone who's perfectly content with just being part of the population and not having higher aspirations, you can be counted as being a Dull Normal. Badass Normals don't count, since they're usually involved with the military and are more focussed on staying alive, and aren't really considered part of society as a whole. What I really want are people who are more Interesting than dull. As long as you've got one saving grace, I'll overlook any other faults you may have. Just don't go around blatantly stealing off obvious ideas. If you're going to rip off someone, rip off an incredibly obscure source, so that once you get rich & famous, they can try to sue the pants off you for stealing their idea and making it popular. After all, it was their idea first, so by all rights, that money should be rightfully theirs! Right? Right? A Deaf Aspergian who's been reading comics since he was born, and has no indication of stopping anytime soon. When Will the Hurting Stop?